In the past, patients undergoing a cataract procedure only had the option of a single-focus lens to correct distance vision. However, they would still have to wear glasses or contact lenses to correct astigmatism. Sometimes, they would undergo additional procedures to correct astigmatism. With the Toric IOL, this astigmatism correction is provided in one step and is more predictable and precise. Astigmatism simply means that the curvature of the cornea is irregular. Instead of being shaped like a basketball, its shape resembles a football with both steep and flat curves. These different curvatures in an astigmatic eye cause light to focus at multiple points in the eye instead of focusing only at one point on the retina (the light sensing part of the eye). The result is blurry, distorted vision. The Toric IOL has been used in more than 25,000 cases nationwide. In clinical trials, 97 percent of patients reported freedom from glasses for distance vision. The Toric IOL is Medicare approved. Medicare and most insurance companies will cover a portion of the cost of this procedure. New insurance guidelines allow the patient to pay the additional costs associated with the Premium Toric IOL because of its astigmatism correction properties. The fees associated with the lens upgrade may be compared to the cost of glasses to correct astigmatism after surgery. In some cases, CareCredit, an independent financing company, may finance the additional fees. Some financing plans are interest-free. For more information on payment plans, please contact our office or visit www.CareCredit.com to apply. By treating astigmatism and cataracts in one step, our patients enjoy clearer distance vision while enjoying activities, such as traveling, sports, driving, and other hobbies, without the hassle of glasses. 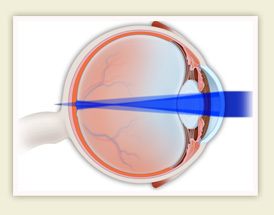 Cataract treatment is among the most commonly performed procedures in the United States. The procedure is performed in an outpatient surgery facility under local anesthesia and can be completed within a matter of minutes. However, it is important to understand that with any medical procedure there may be unforeseen complications and that outcomes cannot be guaranteed. Even with our best efforts, some patients may still require minimal correction to sharpen their vision. At Omni Eye Care, patient care is of utmost concern. Our staff will discuss your lifestyle and vision needs to help you determine which treatment is the best for you. Our goal is to provide the most advanced surgical treatment options while maintaining patient safety and satisfaction. 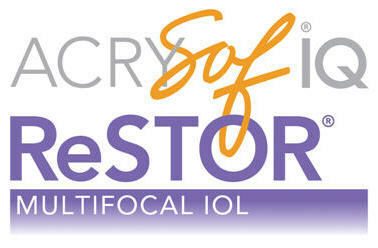 For more information on the Toric IOL or other treatment options, including cataract surgery, please contact our office. 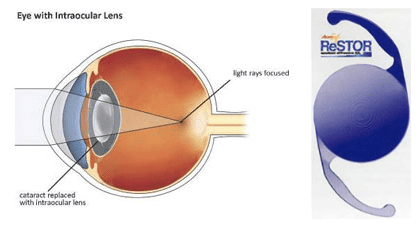 The ReSTOR® lens functions very much like the normal human lens. It is important to remember that reading vision in low light is also influenced by the overall health of your eye and by the condition of the light sensors in the retina. As we get older, our ability to see in low-light conditions may start to decrease. It is always best to read in good light conditions. Your doctor will provide you with medications to prevent infection and decrease inflammation and may provide a protective shield to cover your eye while sleeping. A pair of plastic, disposable sunglasses will decrease your sensitivity to light as well as providing protection during the day. What will the ReSTOR® procedure cost? Financing options available? In some cases, CareCredit, an independent financing company, may finance the additional fees associated with the procedure. Some financing plans are interest-free. For more information on payment plans, please contact our office or visit www.CareCredit.com to apply.